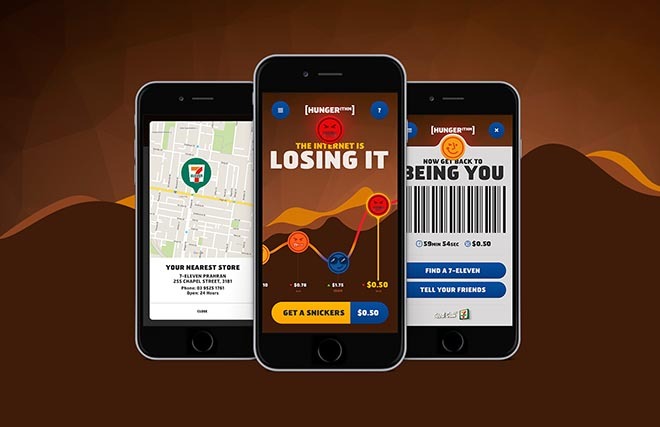 Mars Chocolate Australia has introduced the SNICKERS® Hungerithm, a hunger algorithm that monitors the mood of the Internet, and then lowers SNICKERS prices accordingly. The Internet gets a little angry when it’s hungry. The angrier people get, the cheaper SNICKERS® get, with prices updating over 140 times a day and dropping to as low as 82% off the normal shelf price. For example, if Donald Trump receives Republican Party endorsement, the price of a SNICKERS® could plummet to 50 cents. Built on a 3,000-word lexicon, the Hungerithm determines online mood by analysing around 14,000 social posts a day. It even understands slang, sarcasm and variations in context. To claim their SNICKERS®, users simply visit Snickers.com.au and click “Get A SNICKERS®” to generate a unique barcode and head to any one of 7-Eleven’s 630 stores around the country. No downloading apps or printing vouchers is required. The nationwide Snickers Hungerithm campaign, online at snickers.com.au, runs until June 27 and includes video, digital, outdoor, PR and social elements that generate and respond to conversation around real world events. SNICKERS® Marketing Manager Renee Lewington says the Hungerithm is perfect for contentious times – such as the upcoming Federal election. “We’re hoping this shows consumers that SNICKERS® is on their side during trying times, and we plan to satisfy even more hungry consumers by rolling the Hungerithm out globally in 2017,” Lewington said. “Considering how quickly the Internet can swing from a place of sharing and enlightenment to one of incredible vitriol, we felt this was the perfect way to bring the, ‘You’re Not You When You’re Hungry’ platform to life,” said Clemenger BBDO Melbourne Executive Creative Director Ant Keogh. 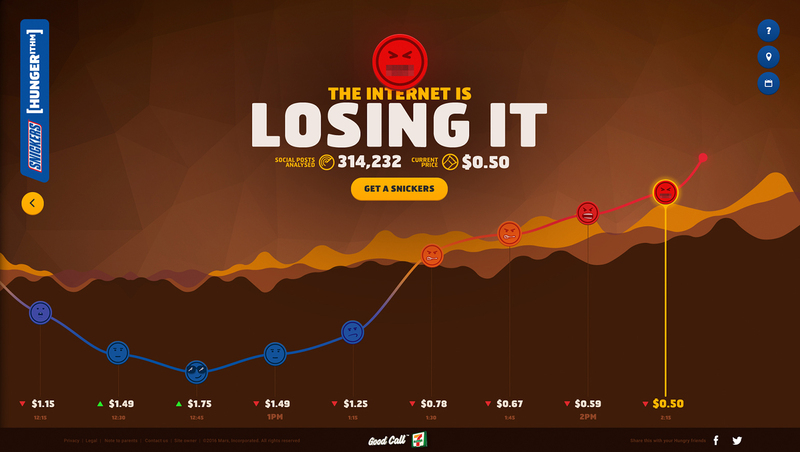 “A data-led idea that changes the price of a global FMCG brand is an amazing opportunity. To launch it at scale through 7-Eleven is something else again,” he said. 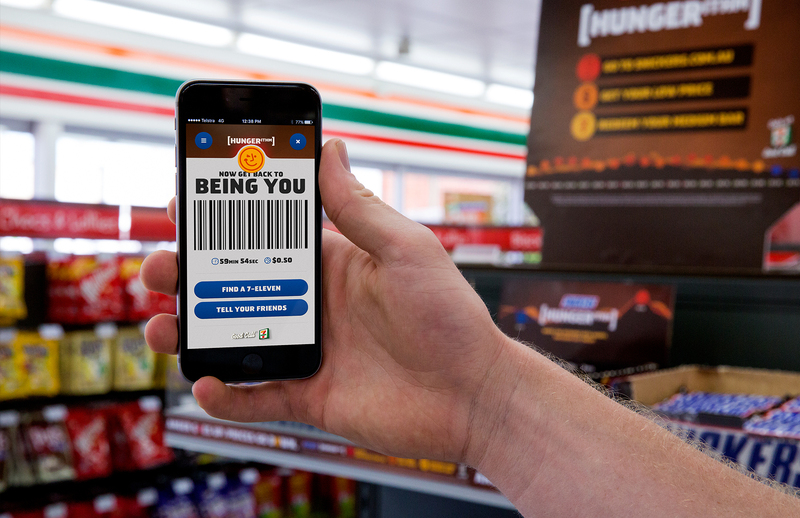 The Hungerithm is designed to bring SNICKERS® world-famous “You’re Not You When You’re Hungry” campaign into the digital age by tying it to real-time reactions to real world events. The campaign has previously featured high profile celebrities such as Betty White, Robin Williams, Joe Pesci and Willem Dafoe (as Marilyn Monroe). The Snickers Hungerithm campaign was developed at Clemenger BBDO Melbourne by executive creative director Ant Keogh, creative directors Evan Roberts and Stephen de Wolf, digital creative director Ben Keenan, art director Jackson Harper, copywriters Shannon Crowe and Jim Robbins, regional director Jennifer Chin, group account director Bryce Coombe, senior account manager Sam Ayre, working with Mars Chocolate Australia Marketing Director Matthew Graham, Brand Manager Renee Lexington, Assistant Brand Manager Heidi Keller and National Sales Manager – Retail Shaun Thomas. Also working on the campaign were PR Director Nichola Patterson, Planning Director Michael Derepas, Senior Planner Matt Pearce, Executive Producer Sonia von Bibra, Head of Interactive Production Christian Russell, Community Manager Will Barber, Senior Digital Producers Nathan VanderByl and Ben Crowe, Digital Producer Allan Ngo, Senior Digital Designer Adam Hengstberger, Senior Developer Andrew McLagan, Senior Full Stack Developer Sylvain Simao. Further work was done at CHE Proximity by front end and back end development director Omar Mashaal, back end development team Andrew Sidorov and Alex Best, technical director Bob Watts and project delivery lead Adam Burnell. Animation was produced at The Jacky Winter Group/Flutter by director Domenico Bartolo, producers Li Liang Johnson and Su Mei Chia, artist Mike Jacobsen, 2D animation and composition team Stephen Elliget, Chris More and Ash Millet.